Following the restoration of Chollas Creek, the Jacobs Center for Neighborhood Innovation conducted a competitive process to commission an artist team to create a permanent art installation at the Chollas Creek Urban Park. The project, a collaboration with the City of San Diego Commission for the Arts and Culture, is supported in part by a $75,000 award from the National Endowment for the Arts. The JCNI received over 25 applications from artists across the country. A selection committee made up of experts in arts and culture, education, land planning, and community stakeholder shortlisted three artists/artists teams to propose conceptual designs. The shortlisted artists conducted a site visit on April 24 to engage with community stakeholders and set priorities for their proposed artwork. The artists’ conceptual designs were reviewed by the selection committee on May 22 and determined artist Deedee Morrison as the artist most qualified to enter into a contract to complete the design, fabrication and installation of her proposed interactive sculpture Visualize Biodiversity. Deedee, who resides in South Carolina, is a professional artist who has extensive experience in public art installations and visual arts exhibitions throughout the country. 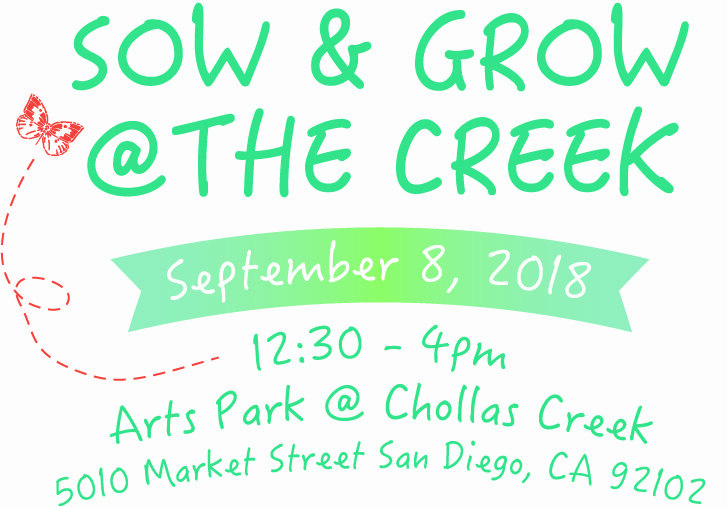 She will be in San Diego on Saturday, September 8 to conduct a community engagement workshop as part of the celebration Sow & Grow @ the Creek to be held from 12:30 – 4 pm. The event will include live music, mural making, activities for families and native plant and butterfly/pollinator workshops. We hope you and your family will join us for this exciting community event! For the day’s line-up and to RSVP, please click here.